I don’t know about you, but for the most of us who own dogs, we are supposed to bring them out for walks every single day, as the right kind of exercise will help them mellow down, eliminating destructive behaviours in the process. Of course, there are some instances when both owner and pet are not exactly living out the most active of lifestyles, which is why it is always good to count the number of steps that your four legged friend and you take each day. 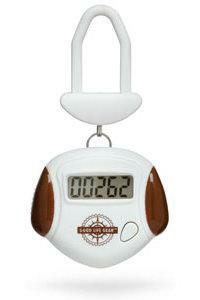 The $9.99 Pet Pedometer will help get the job done for you, where it can be clipped in a cinch over your dog’s collar. All it takes is a press press of a button, and it will be able to measure your dog’s number of strides while displaying the steps accurately – up to 99,999 steps, in fact. Of course, you can also bring this on long hiking trips and compare your steps to your pup’s as well. It is powered by a single button-cell battery, hopefully it will be waterproof and tough enough to withstand your everyday rough and tumble lifestyle.